What is this, you ask? This is a little piece of heaven. Mango, cream, konafa, and soft cake are layered in a perfect combination of sweet and smooth with crunchy and tart. Where has this been all these years? Why am I just tasting this now?!! I'm so glad that I didn't have to leave my sweet tooth behind when I moved to Egypt. And I have QUITE the sweet tooth, let me tell you! The truth is that I don't bake because I like to bake but rather I bake because I like to EAT the things I bake. Chocolate chip cookies, brownies, coffee cakes of all kinds, muffins, banana breads,...and on the list goes. And while I am not a full convert to the ways of eating Egyptian desserts, I would say that they make a decent showing alongside the traditional sugar-based desserts that I hold so dear from back home. Most desserts in Egypt are honey-based. By "honey-based" I mean that the main source of sweetness in most desserts is honey. For me, this makes many of the traditional sweets here rather rich and heavy. A small piece will usually fill me up quickly, although I have been known to scarf down more than a few pieces at a time every once in a while. 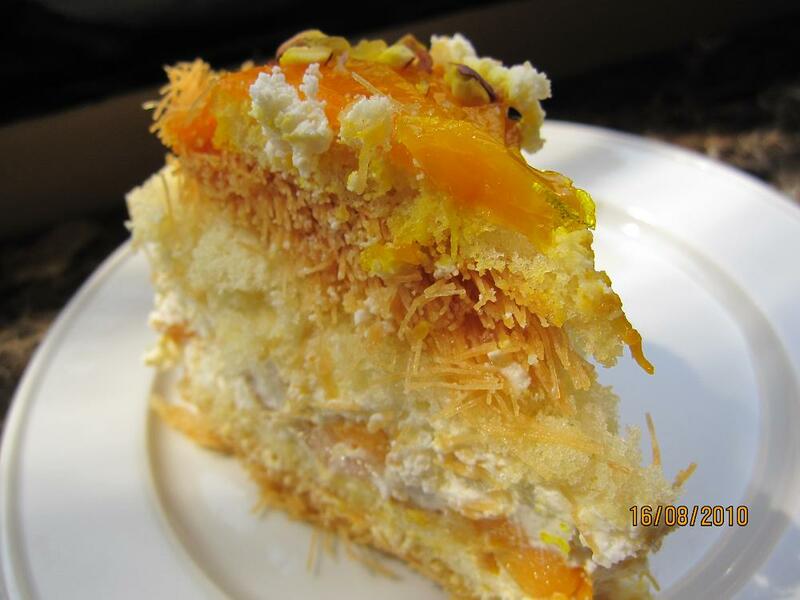 The Mango Konafa that you see pictured above is famous among Cairo residents. It's made by the patisserie Le Carnival only at Ramadan time (which incidentally coincides with mango season this year). Hence the little piece of heaven that I described above. Other desserts that are famous around here are baklava, basbousa, and konafa. Most of you will be familiar with some form of baklava ("baklawa" in Arabic) with its layers of phyllo dough, nuts, and sweet syrupy goodness. Basbousa is a kind of cake-like treat made from what tastes like cornmeal. It is surprisingly delicious, even for you Southerners who thought perhaps that cornmeal was destined only for that iron skillet you've got hidden away in your kitchen. And as for konafa, well, it's not really my favorite. It has a kind of straw-like texture that makes it difficult to chew and a bit dry for my tastes. But I have to say that lots of people love it around here. I must admit that I have not tried my hand of making any of these desserts at home. I take that back, I DID take a basbousa box mix back with me to Kentucky a couple of years ago. And although my family back home at it with gusto, I was personally disappointed with my meager attempt to duplicate the basbousa we get in the sweet shops here. The fact is, my friends, that I'm just plain lazy. I'm not out to prove anything. I just want to eat good food that reminds me of home - which as I mentioned above is why I love to cook and bake so much in the first place. But if I can get something better that's store-bought....well, I think you get the picture. May you always be accompanied by a cup of steaming hot tea!